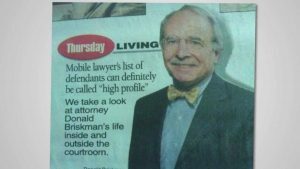 High Profile Cases - Briskman & Binion, P.C. Since 1988, the lawyers of Briskman & Binion have provided top-tier legal solutions to individuals and also businesses in Mobile and South Alabama. Briskman & Binion a full-service Mobile, Alabama law firm providing in-depth legal services across the entire spectrum of general law. Our experienced lawyers offer vigorous representation with legal matters that can arise throughout a lifetime. These include family law, employment law, corporate litigation, insurance defense, personal injury, workman’s compensation as well as criminal defense. Briskman & Binion has successfully been able to establish our reputation as aggressive trial attorneys. We have a location that is in a unique position to best serve our clients. Briskman & Binion believes our time-honored approach to practicing law distinguishes our firm, ranking our Mobile, Alabama attorneys at the forefront of Mobile, Alabama general practice law offices. In 2013, we celebrated our 25th Anniversary.